I have been a member of Influenster for a few months now and the surveys are short and super easy. I have just been chosen for my first VoxBox. 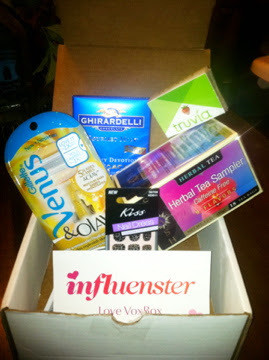 The Love VoxBox arrived in a small white box with the influenster logo on the side. I can't wait to try out all these items and see how they are. All for filling out a few surveys that maybe took 1-3 minutes tops. The surveys ask simple questions that you tell the likelihood of you doing or using certain things, what type of store you buy them, etc. It's never lengthy fill ins, or I definitely wouldn't be involved. I'll be sharing my experiences with the nail product and razor with my readers here, since it pertains to this blog's niche, and the other products I can post quick reviews about on the Influenster Product Reviews tab at their site. They offer other incentives as well for those spreading the product and influenster word through social media, such as tweeting, facebook posts, etc. With influenster you're basically part of an awesome marketing/home sampling program that's free aside from a little bit of your time. Check out influenster.com today if this sounds like something you might be interested in. Remember, there's no gaurantee that you'll get chosen to recieve the VoxBox, but interacting on the site may increase your chances. And if you do get chosen, from personal experience it's all the beauty of a paid sampling program for none of the cost. You get a little bit of everything from full sized beauty, to edibles, to drinks, to personal care products. Plus, It's fun getting presents in the mail !! Disclosure: I am in no way compensated for this post or affiliated with infuenster other than being a member of their site. All my opinions are 100% honest and my own. I just signed up to try this. I hope I am selected so that I can try out some of the goodies. This sounds awesome. I also just signed up for this. Hope I get a box! No problem! Glad you're all going to try it. It's a great program and I hope you all get chosen for boxes soon! I recommend using the kiss nail dress if you do not have the "nail art talent" but would like a cute look for a night out! Mine did not last 10 days,it lasted 2.I did love the design I choose and there were many ways to design my nails,not just having the full nail art. I would rate this product a 5. Was not a big pain to put on, looked great..just wish it lasted longer! so i just sign up to this......and thats it????? will i get an email with a survey or what? Check out the website and set up your profile. There are surveys that you take on the website, you can pick and choose the ones you want to do. If you qualify for a VoxBox they will usually send an email for a pre-survey to see if you best fit the campaign.